If you follow me on my blog or YouTube channel you already know we moved to a new place earlier this year. I knew that our new home would have more modern pieces, to give it a simple yet open space feel. Our new place is decent size, but not too big. When you decor with light colors, it gives the illusion the space is bigger than it is. I can't wait to do a home video tour once I finish a few more pieces I'm getting soon. Most of the home decor items I have bough are from Amazon. Amazon for me is my to-go site to find something specific I have in mind. A great gift idea for guys. I'm planning on buying this one for my boyfriend. You can predict the weather with this storm glass. Once I get my new floating wall shelf from Ikea I would like to get one to place it on top. I actually got this for one of my bathrooms in silver. It's also available in gold color for a modern look. Crystals carry cleansing properties. It's a good idea to have a few in your home to cleanse your home energy. I'm planning on getting a white one for my bedroom, and a blue one for Little Lyn's bathroom. How cute is this white pineapple with gold? It looks super cute, and has positive reviews! Literally a cute, modern twist to a regular white sharpener. Looks different from typical sharpeners, and makes a great gift. I own one and I love it! I actually shared this lamp in my June favorites. It's a small white modern lamp with a lot of light. I have it in my bedroom. I love reading this quote because it makes me feel inspired each time. It's in my room background of my June favorites vido, and I bought a metal portrait frame to go with it. The quote is actually gold metallic. This kitty mug is actually called the 'Mugtail Cat'. I love cats, but they actually have other animals available if you want to collect all of them. How cute is this modern, and minimalist tissue house? It looks interesting, and cute at the same time. I recently discovered the brand Umbra. Umbra creates modern designs for home decor. This is such a unique way to display some of your jewelry pieces. Another modern creation by Umbra. Display your books, or other belongings in a different way. I love the look of this and you can hang it upright, or sideways for a different look. When I was getting a new lamp for our room I was undecided between the white table lamp I shared here, or this pink Himalayan lamp. I would definitely go with this one instead for all its benefits! Third product I mention from Umbra! You can tell by now I really like their modern designs, haha. 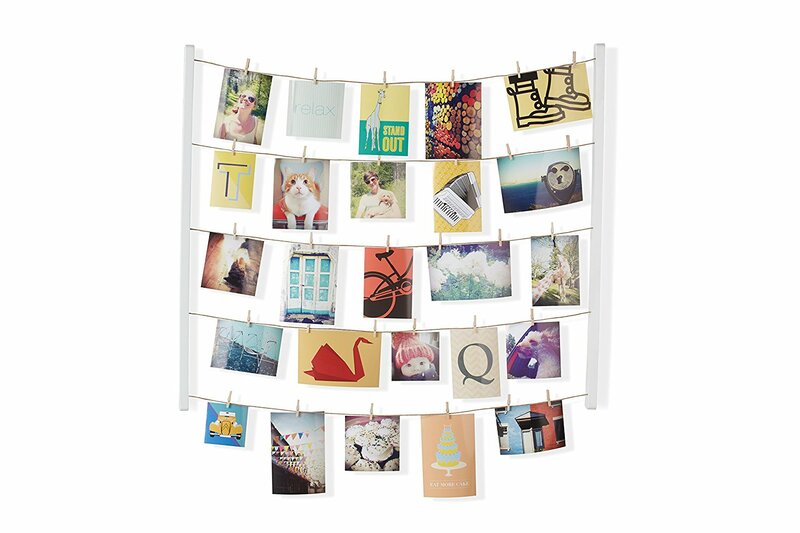 This is a cute way to display your pictures, and they have it available in black, chrome, copper and matte brass. This is currently in my Amazon shopping cart. I usually accumulate a few products in the cart before I make a purchase. I can't wait to get this and replace my old photo display in the living room. This is a sphere glass terrarium for succulent and air plants. A cute, and modern way to display your beautiful plants. For succulent plants, air plant, mini cactus, faux plants, and more. Another modern, and cute way to display your little plants. This is an attractive geometric modern design by Umbra. By now you can really tell how much I like Umbra haha. THIS POST CONTAINS AFFILIATE LINKS WHICH MEANS THAT IF YOU MAKE A PURCHASE THROUGH ONE OF THE PRODUCT LINKS I’LL RECEIVE A SMALL COMMISSION TO HELP KEEP THIS SITE RUNNING. 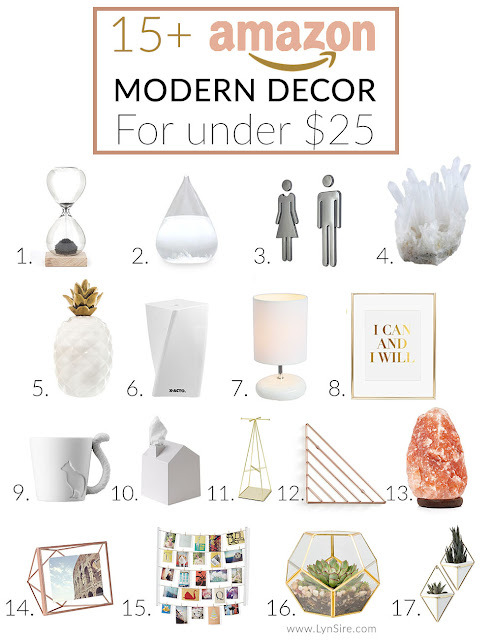 Which is your favorite modern decor piece from this list? Leave me a comment down below! 5 Unique Home Decor Ideas. These pieces look amazing, I'm going to check it out. I'm going to check out "I can and I will"
Super cute, I actually moved into my new home yesterday and can't wait to spice things up with cute home decor! These are all such super cute ideas! I love that photo stand =) It's so modern! I feel like it's such a better way to display photos. Thanks for sharing these ideas! This is perfect considering I am just decorating my room!! Thanks for sharing!